How do I customize the theme of registration, pricing and payment pages? When you are modifying root templates, like base.html for example, you may inadvertently break the dashboard and become unable to access the theme page to upload a fix. You can always remove all custom templates and reset to the default theme but you will need an API key in order to trigger the reset (remember most or all functionality might not be accessible through a Web Browser after a broken theme was uploaded). You must use the following structure in the zip file to override the default theme. All files are optional. 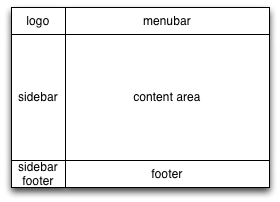 The default template will be used for a missing file. All files under the templates directory are HTML or email layout templates. Some file names are reserved and will interact with the reverse-proxy logic (ex: login.html, register.html, pricing.html) otherwise all other HTML files will be served as static HTML pages. Editing HTML files and uploading them can be cumbersome. It is a process is also not suitable for other people in your business, with little or no technical knowledge. We will want to make some text on the home page (index.html) editable online for example. In order to do that we add an .editable class and a unique id to a paragraph. all editable elements must contain an editable class. all editable elements must have an UNIQUE id attribute. To enable Markdown edition on an element, add a edit-markdown class. To transform <IMG> and <VIDEO> nodes into placeholders, add a droppable-image class. Public static assets (images, js, css) are all files which are downloaded by the client as-is. For best performance, they are best cached and served by a Content Delivery Network (CDN) such as Fastly or Cloudflare. Depending on how you have organized your development and deployment workflow, the reference files for public assets (images, js, css) can either be served from your app container, or installed as part of the theme package (package.zip). 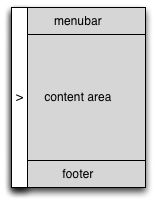 The only technical difference between putting the assets in the container vs. the zip is how the asset cache is filled. To get started in most cases, you will want to download the default theme, make your modifications and upload the changes. Templates for the default theme are written in HTML5 and styled with Bootstrap4. The following sections describe how the default theme was designed and where to find various elements. The default theme is designed with mobile-first in mind because many boutique SaaS owner work out their support requests on-the-go, out of a large screen phone. As a result the wireframe is built to accomodate phone screens, then handle desktop screens with little changes to the look-and-feel. logo: A image that serves to quickly identify the company or product, doubled with a hot link to expand/collapse the sidebar. menubar: Sign-in or authenticated user, doubled with primary links (ex: Pricing, Documentation) on a desktop. sidebar: links to pages for profiles, billing, subscriptions, etc. It also contains the primary links (Pricing, Documentation) on mobile. On mobile the sidebar collapses. Mobile pages also tend to increase vertical scrolling. As a result the button to expand the sidebar out should stick to the viewport in order to be available when needed. The default theme chooses to stick the menubar on mobile and put the expand button in the top left corner. This has the benefit to also keep the menubar for the authenticated user on screen. An Alaternative is to keep the right edge of sidebar always visible on screen so it can be pulled out when necessary. The sliding visual effect when the sidebar expand is nicer. It also works better in cases where the sidebar can vary in width based on a user intent. Since the right edge is always visible, it does though shrink vertical space for the content, space that is in tight supply on a mobile screen. 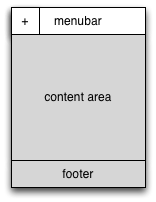 HTML5 defines a Document Object Model (DOM) as a tree of nodes with parent and children. 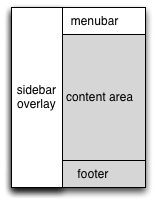 The sidebar being expandable and sticky to the viewport, we decide to put the 3 elements logo, sidebar and sidebar footer as siblings into a .dashboard-nav parent and the 3 elements menubar, content area and footer as siblings into a .dashboard-content parent. Both .dashboard-nav and .dashboard-content are at the same level, laid out side-by-side by using various css features. Pages that are typically associated with a specific workflow, such as registration or checkout for example. Pages for a subscriber to update their profile, credit card on file, view billing history, unsubscribe and other administrative features expected by a user of a Software-as-Service product. Landing page for links sent in an activation e-mail. This page is presented to visitors when login and/or registration have been disabled for the site. The classic username (or email) and password login page. Landing page after a user signs out. Page typically linked from a "Forgot password?" link to recover a user account through an e-mail address. A versatile user registration page. For example, see tutorial on how to use this page to implement frictionless onboarding. Landing page for the link sent in an recover password e-mail. A "Contact Us" form. Managers of the site will receive an e-mail with the content of the contact form. Presents the user with a payment page for past due balances. This page is very similar to the Cart page. Presents the user with a checkout page to pay for subscription plans selected in the pricing page. Presents the user with a receipt for a successful charge on a credit card. Shows a single agreement (or policy) document. The content of the agreement is read from saas/agreements/slug.md. Asks the user to sign the agreement presented in order to continue with using the product. Pricing page with subscription plans for the service. Presents the user with a form used to create a new profile. 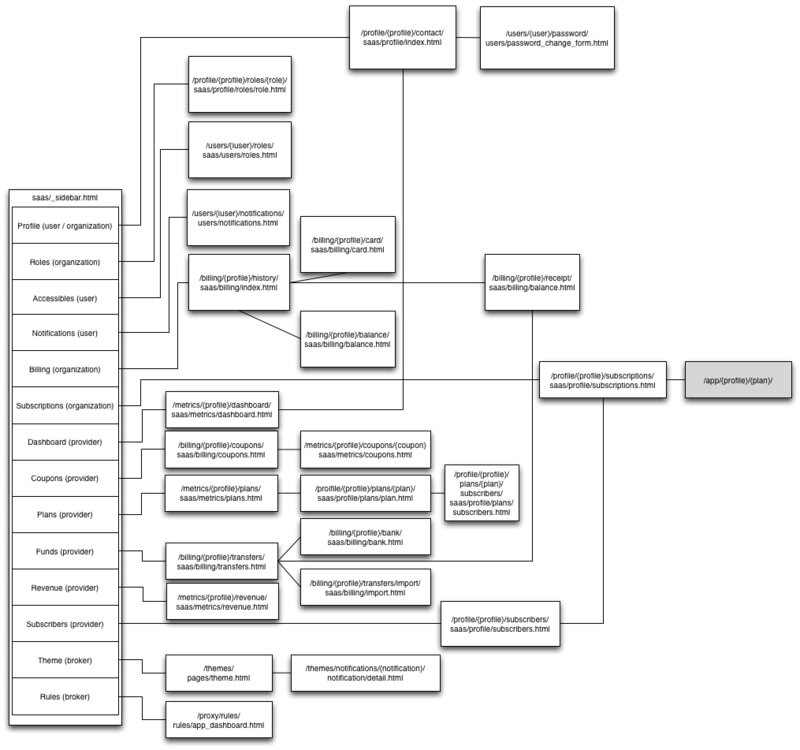 User and Organization are separate models linked together through a Role. By default, the request user becomes a profile manager of the newly created profile (also called Organization model). The complete User, Organization and role might be exposed right away to the person registering to the site. This is very usual in Enterprise software. On the hand, a site might decide to keep the complexity hidden by enforcing a one-to-one manager relationship between a User (login) and an Organization (payment profile). This page shows a list of organizations accessible by the user when a redirect is performed because the original URL does not reference a specific profile. Redeem a discount code. After the code is submitted, the pricing page is displayed with prices reflecting the discount. Pages for subscriber to update their profile, billing and subscriptions. Pages for providers to support subscribers and assess the performance of the business. Pages for brokers to modify the theme and update access control rules. Page to update name, e-mail and street address of an account. Page to manage the credit card on file associated with the profile. Page to show active and expired subscriptions for an account. On this page a user can also unsubscribe. Page with all users having the specified role on the organization account. Through this page, already registered users or not yet registered users can be granted a role on the account. The newly added user will be notified by an e-mail that it was granted a role on the account. This page is the dual of the account role page. Instead of listing the users with a specified role on an account, it lists all the accounts the specified user has a role on. Enable or disable specific notifications sent by the site (ex: user registered, charge receipt). Page to update a user password. Receipt for a successful charge by the payment processor. This page is used in both in the workflow and dashboard. As the last step of a payment workflow, before moving to the application business logic, the dashboard sidebar is showing on a receipt page, such that a user has the opportunity to understand where the receipts can be found later on in the interface. High-level dashboard for a quick glance of the business in real-time. Entry point to search for a account. Page to connect a processor to handle charges (ex: Stripe). Page for a provider to upload a payment that was made offline. List payments made to a provider or funds transfered to the provider bank. Presents details about the use of a discount code. Page to manage a provider's plans. Page used by a provider to manage a single plan. Presents the performance of subscription plans for a time period (as a count of subscribers per plan per month). List active and churned subscribers on any plans of a provider. Reports cash flow and revenue in currency units from subscriptions over a trailing 12-month period. This page presents the user with the tools to live edit a notification e-mail template. This page presents the user with the functionality to download and upload a theme, reset to the default theme, turn on the live edition tools for web pages and live edit the notification templates. These are e-mail templates sent to users as part of various workflows. Template for e-mail sent to a customer when the credit card on file has been updated. Template for e-mail sent to a customer when a charge was successfully created on the credit card. This template is also used to notify customers of refunds. Template for e-mail sent to notify a user that a third-party has paid for their subscription on the site as part of GroupBuy checkout workflow. Template for e-mail sent to notify a customer that their subscription on the site is about to expire. Template for e-mail sent to a customer when an order has been recorded but payment is still due. Template for e-mail sent to a customer when fields in her profile have been updated. Template for e-mail sent to a user in response to a recover forgotten password event. The template contains a back link to the website where the user will be prompted for a new password. Template for e-mail sent to profile managers in response to a user accepting a role on the profile. This e-mails are only sent for roles requiring a double opt-in. Template for e-mail sent to a user who was granted a role to a profile. Template for e-mail sent to profile managers that a user requested a role on the profile. Template for e-mail sent to profile managers in response to a subscription that was previously granted being accepted. This e-mails are only sent for subscriptions requiring a double opt-in. Template for e-mail sent to a subscribers who were granted a subscription. Template for e-mail sent to subscribers when a provider has accepted their request for a subscription. This e-mails are only generated when a subscription plan is setup for double opt-in. Template for e-mail sent to profile managers of a broker when a user has activated their account. Template for e-mail sent to profile managers of a broker when a user has submitted a contact form through the /contact/ URL. Template for e-mail sent to profile managers of a broker when a user has registered an account. Template for e-mail sent to a user after they register their account. Template for e-mail sent to a user as part of the account activation flow to verify their e-mail address. Menu items for the menubar at the top of the page. Logo in the top left corner of a page. Pop-up menu that is displayed when a user clicks on their username in the top menu bar. 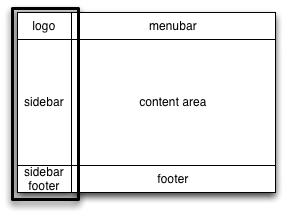 This partial is also used to fill the HTML element with class="header-menubar" on the pages served by the app container. Menu items in the sidebar of the dashboard pages. These templates are used when various errors are inevitable generated by the site. Page displayed when a generic HTTP error code 400 is generated. Page displayed when a permission denied, aka HTTP 403, is generated. Page displayed when a URL can not be found, aka HTTP 404. Page displayed when an internal server error, aka HTTP 500, is generated. Because 500 errors indicates something with the internal logic of the site went horribly wrong, it is important that this template is a self contained plain HTML file, otherwise it might result in cascaded errors and the page will not show up as expected. Page displayed when the application behind djaoapp cannot be reached.